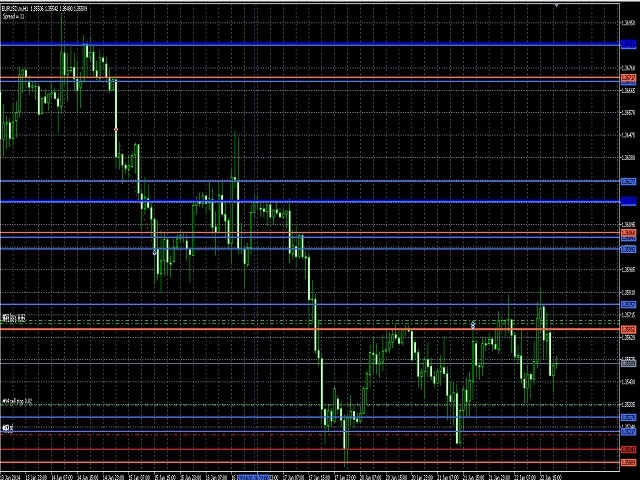 The EA is designed for trading on the EURUSD currency pair. For each open position, a loss limit(StopLoss) is mandatory. The StopLoss size is fixed. The lot size of each position is set automatically by the function that is responsible for trading risks. In turn, trading risks are determined by the user using the "Risk" parameter. The value of this parameter determines the risk as a percentage of the balance per trade. The number of simultaneously opened positions is not regulated and is determined by the trading strategy. The trading strategy is directly related to the trading levels that the EA finds in the process of using historical data. When the trading conditions come, the EA sets a stop order for buy or sell, under certain conditions, these can be multidirectional orders. Closing positions is also directly or indirectly related to the levels found by the EA. Also, when closing positions in certain cases, the expert Advisor takes into account the size of the possible loss when determining the amount of profit. In some cases, the profit cannot be less than the expected loss. The EA can be used both in fully automatic mode and as an assistant in manual trading. If you set the "DROW" parameter to true when you set the expert Advisor on the chart, the chart will display the critical levels defined by the strategy, which can be used for trading. And setting the parameter "MAGIC" is equal to "0" ,the EA for each of Your positions to establish a StopLoss with size that You set in parameter "StopLoss". The EA will also close your open positions manually. To solely automatic trading install the "MAGIC" parameter other than "0". When testing or optimizing the expert Advisor, it is recommended to disable the "DROW" parameter to speed up the process. The EA was optimized at a historical distance of five years, so you can see periods of quite long stagnation on the chart. This is normal for long term trading. During the development of the expert Advisor, the main attention was paid to the reliability and stability of the long-term trading. You can try to optimize the EA at a short distance to adapt to the current market, but my recommendations are to follow the proven settings. The EA does not use risky strategies such as martingale and others. Your computer must be turned on around the clock, so I recommend using VPS. Before working and installing on the account, optimize the EA on the quotes of Your broker! Optimized the code . Work in the tester is accelerated. Variable "Level", now an integer. The EA code has been modified. Fixed minor bugs.